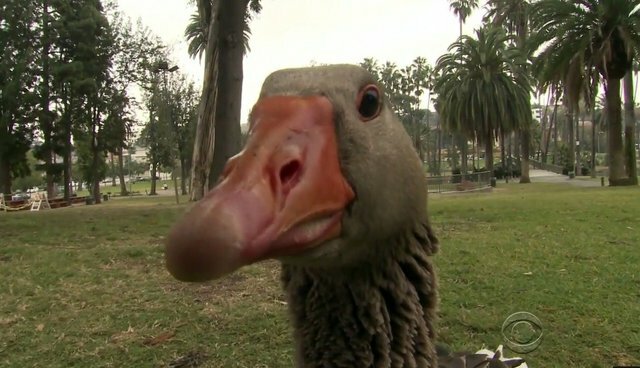 A few years back, the story of a Los Angeles man and his avian companion made international headlines as an example of interspecies friendship at its finest. Each morning, when retired rotisserie chicken salesman Dominic Ehrler arrived to his local park for a walk, a goose named Mario would race to join him, inexplicably preferring that particular human's company even to his own kind. So strong was their bond that when Dominic tried to return home on his scooter, Mario would fly next to him, not wanting to leave his side. Sadly, as news of the heartwarming friendship spread, city officials began to fear for the bird's safety. It was ultimately decided that Mario was to be moved from the park's artificial pond to an enclosure at the Los Angeles Zoo -- but that wasn't enough to put an end their morning get-togethers.